“The Green was the place where trades, merchandise, public business, military exercises, shows, sports, festivals, and the general entertainment of the town, found a center. The County Jail stood on the North side of the foot of the hill; the courthouse was in the open areal the Post-Office not far from the meeting house…and taverns, schools and shops alternating with private dwellings around the border” (Frances Caulkins History of Norwich, 21-22). 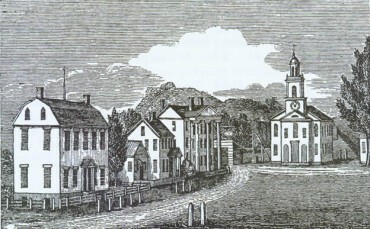 The Green had many iconic features in the 18th Century such as the meetinghouse, a post office, a liberty tree, where citizens gathered to resist British oppression, a jail, which briefly housed traitor Dr. Benjamin Church for giving secrets to British General Gage, a courthouse, a powder house and a pillory. Retail shops and workshops such as Joseph Carpenter’s Silversmith shop brought wealth and commerce to the area. Over twenty trades such as cotton manufacturing, watch making and bookbinding flourished in Norwich. Sarah Knight, Joseph Peck, Thomas Leffingwell, Simon Huntington Jr., Eleazer Lord, Azariah Lathrop, and Jesse Brown all operated taverns near or around the Green. It was in taverns where ideas were exchanged and political divisions were debated. Norwichtown had many fascinating visitors and residents; President John Adams and Abigail Adams dined at Jesse Brown’s tavern and stagecoach stop and were greeted by a 16 federal gun salute, Lafayette camped on the Green with his soldiers, Jean Pierre Boyer, later President of the Republic of Haiti, was captured and stayed with the Manning family from 1800-1801, and Benjamin Butler, a local blacksmith, was a loyalist. Samuel Huntington, signer of the Declaration of Independence and President of the Continental Congress, Benedict Arnold, infamous Revolutionary War General, Jedediah and Ebenezer Huntington, prominent Revolutionary War Generals, and Christopher Leffingwell, purveyor of provisions for the Continental Army, all had residences near the Norwichtown Green. President Millard Fillmore, First Lady Edith Carrow Roosevelt and President Grover Cleveland can trace their ancestry back to Norwich. By the 19th century, the center of town shifted to the harbor and a new courthouse and shops were built. Many homes that surround the Green today date back to the 18th century.